You know when you see a brand new movie preview and you are convinced that your kids will definitely want to see the movie? Ok, let's be honest, you see the trailer and you immediately show it to your kids because YOU want to see it and want them to be as excited as you are. That's how I felt about the new movie THE WILD LIFE. I love a movie that I know I can take my kids to, we will all be entertained, and most importantly we will build memories together as a family. Once I saw the trailer I knew that THE WILD LIFE would be one of these movies. I also knew I had to make a special lunch for my kids to continue the excitement. The movie releases on September 9th, so I wanted to share this recipe with you before it comes out. But first, check out the trailer below. Since "Mak" is one of the main characters, I decided to make him the center of the lunch. He definitely is colorful and was a perfect fit for the strawberries that we already had in our fridge. THE WILD LIFE takes place on a tropical island, with talking animals, shipwrecks, beaches, Robinson Crusoe, and pirates! I packed as many of those elements as I could into the lunch. 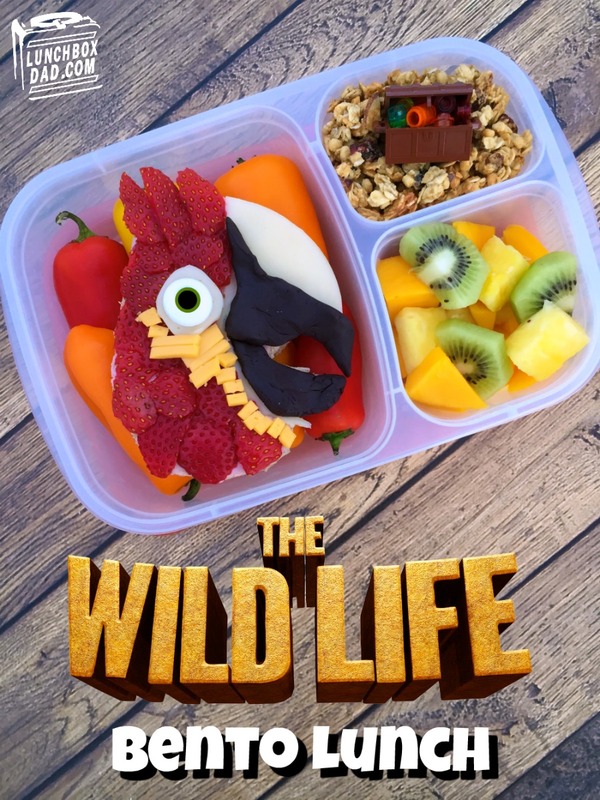 To find out more about THE WILD LIFE check the movie out on Facebook, Twitter, and Instagram and use #TheWildLife all over social media! 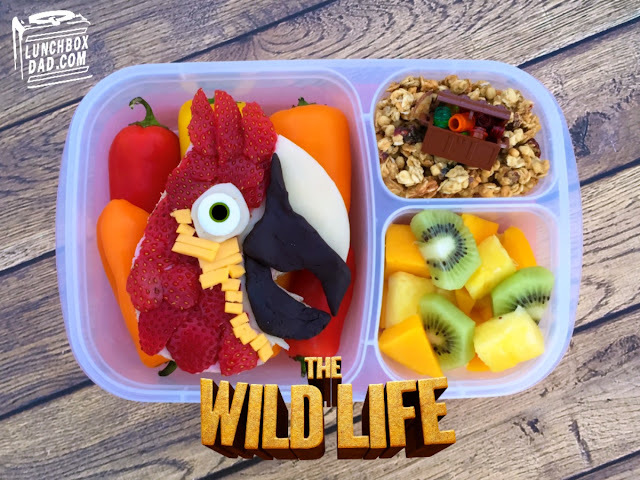 Ingredients: Two slices whole wheat bread, strawberry cream cheese, strawberries, sliced provolone cheese, sweet peppers, cheddar cheese, black edible modeling dough, candy googly eye, honey, sliced kiwi, sliced mango, sliced pineapple, granola, treasure chest decoration. 1. Cut two slices of bread into a shape that is similar to the one below. It doesn't have to be exact, just get it close. Cover one slice with honey and place second slice on top. Cover second slice with strawberry cream cheese. Cut provolone cheese into shape of the beak. Place where beak goes on Mak's head. 2. Cut strawberries into narrow slices. Starting from the bottom of the bread, place on parrot's head until it is covered in red. Cut circle eye piece out of provolone cheese and place on top of strawberries. Put candy eye on top of that. Cut cheddar cheese into small square pieces and put on top of strawberries where shown. Use a little bit of cream cheese if needed to hold all of these in place. Shape black modeling dough into a bottom and top beak. It is moldable just like play dough. Place on Mak's face to finish the beak. 3. Cut sweet pepper's in half and put in main compartment of lunchbox. Place Mak the Parrot sandwich on top. In side compartment drop in kiwi, pineapple, and mango. 4. In second side compartment pour in granola (for sand). Top with any sort of "treasure chest" decoration. This could be a toy or simply a paper cutout of a picture you get from the internet. Anything will work. Serve to your kids and enjoy! I hope you and your kids have fun in THE WILD LIFE. Let me know who your favorite character is and what your kids thought the funniest part of the movie was!